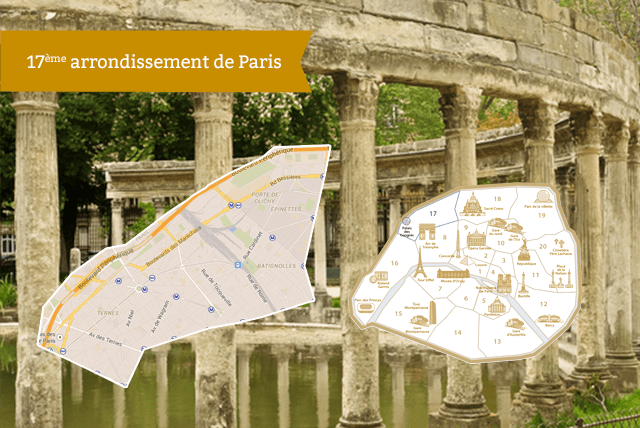 The western part of the 17th arrondissement is one of the most beautiful areas of Paris. It has avenues of elegant buildings that run as straight as an arrow, small villas hidden from view and inhabitants whose impeccable attire signals their memberhsip of a particular social class (the Monceau aristocracy and the bourgeoisie des Ternes). It is a mirror to Haussman's megalomaniac will as he worked for his emperor. The main attraction of this district is the convention center ... as well as the Quartier des Batignolles and Ternes. It is also an area with very heavy traffic on its main roads and the many office workers ensure that the area is always busy, filling the local brasseries at lunchtime. Yhe eastern part of the quartier marches to the beat of a very different drum. On the other side of the railway line that terminates at Gare Saint-Lazare, there is a village that adjoins the rather more working class quartiers around Place de Clichy. This village, called Les Batignolles, has retained a rather provincial air, with quiet squares where you can take the sun, lively streets and tiny cobbled courtyards filled with pots of flowering plants.